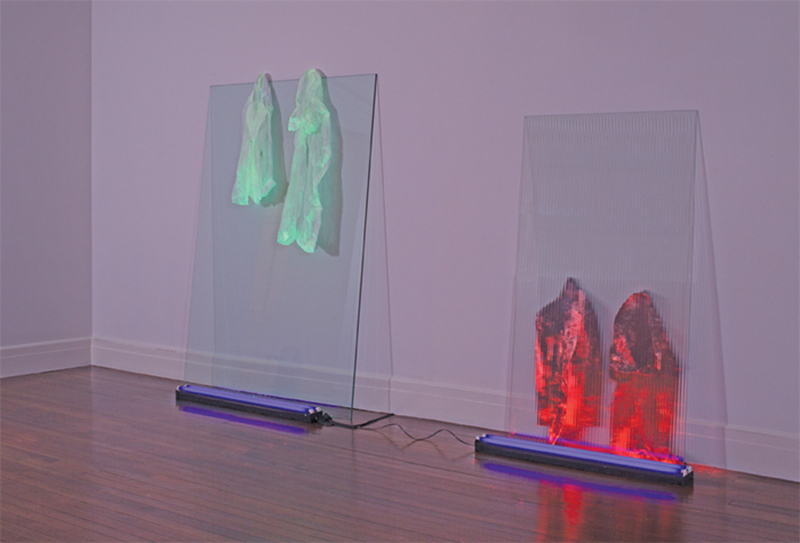 Keith Sonnier, Ju-Ju, 1970, cheesecloth, black lights, glass, 7' 4“ × 12' 6” × 1' 4". © Artists Rights Society (ARS), New York/ADAGP, Paris. A bit of backstory is in order. Leo Castelli’s response to post-Minimalism (notably, to the work of Richard Serra) was to arrange for exhibitions of the new style in a former art shipper’s warehouse located in west Harlem. The raw, garage-like space of Hague Movers perfectly accommodated the vastly expanded scale and the light-infused and propulsively distributed forms of the new dispensation.